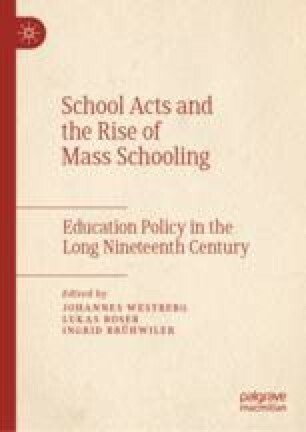 This chapter examines the relationship between the nation-building process in France and the erection of a national school system during the nineteenth century. While this system was aimed at mass education, closer examination of the landmark school acts from that period—specifically the 1833 Guizot law, the 1850 Falloux law, the 1867 Duruy law, the 1881 and 1882 Ferry laws, and the 1886 Goblet organic law, as well as their effects—reveals the inner contradictions of nation building in France and their consequences upon mass schooling. Throughout the century, statesmen built a structured institution of primary education for the children of the people in order to instill reverence for and obedience to a republican and secular France, and ensure that their place as citizens, men, and women was determined from the beginning.